Mindy Rhodes speaks to Mr. Andrew Semon and the Westtown Township BoS during Public Comment. Historical Significance Narrative: An editable letter template, to your Legislator, concerning the Historical Significance of Crebilly Farm. Thank you to Glynnis Harvey! 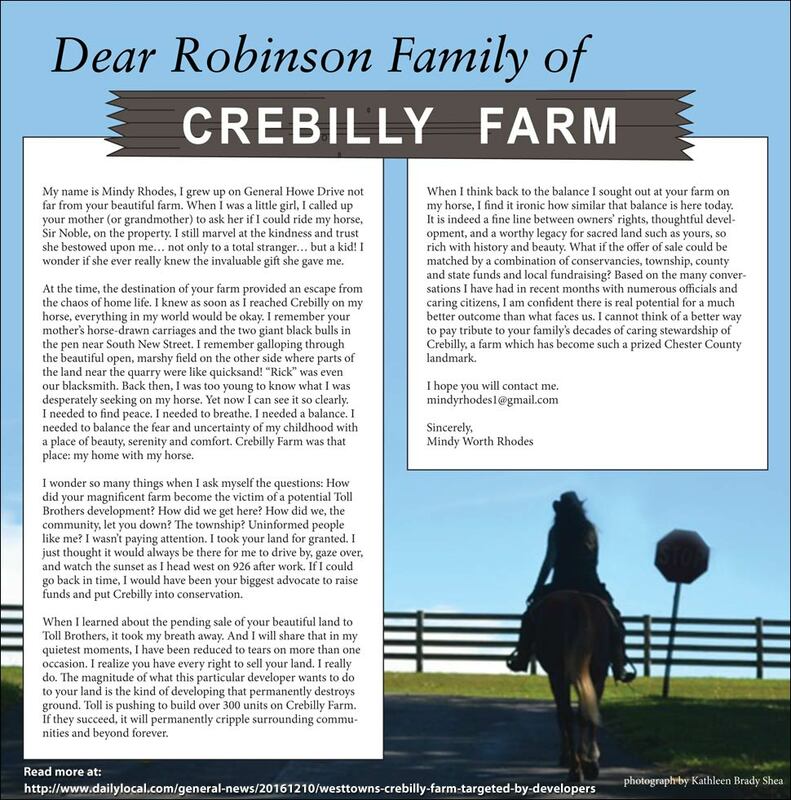 Negative Impact Narrative: An editable letter template, to your Legislator, concerning the Negative Impact of Crebilly Farm development. Thank you to Glynnis Harvey! Crebilly Farm is not like any other land. It is not like any land your company has developed before. She is unique unto herself. She is a piece of American History. She is a beloved landmark to this area. Her beauty is captivating. And what she gives, to all who pass by her, is immeasurable. To The Westtown Township Planning Commission, A Thank You, from long-time resident Boots T. Thank you for sharing. Mr. Pomerantz, Planning Commission Chair, comments 1/10/17, click here. Mr. Pomerantz, Planning Commission Chair, comments 12/15/16, click here. Mr. Pomerantz, Planning Commission Chair, comments 11/16/16, click here. One concerned citizen of Pocopson Township takes initiative, asks his BoS to seek Party Status, click here. To read complete resolution, click here. Mr. Doug Anderson’s presentation to the Planning Commission on Tuesday night, January 24th, brought many cheers and some people to their feet. Below is the closing paragraph. What you have proposed does not respect Westtown, does not respect the residents, does not respect history, does not respect the patriots who fought and died here in 1777. What you have proposed does not respect Crebilly Farm. You are not welcome here. Pack up your portfolios. Go home. 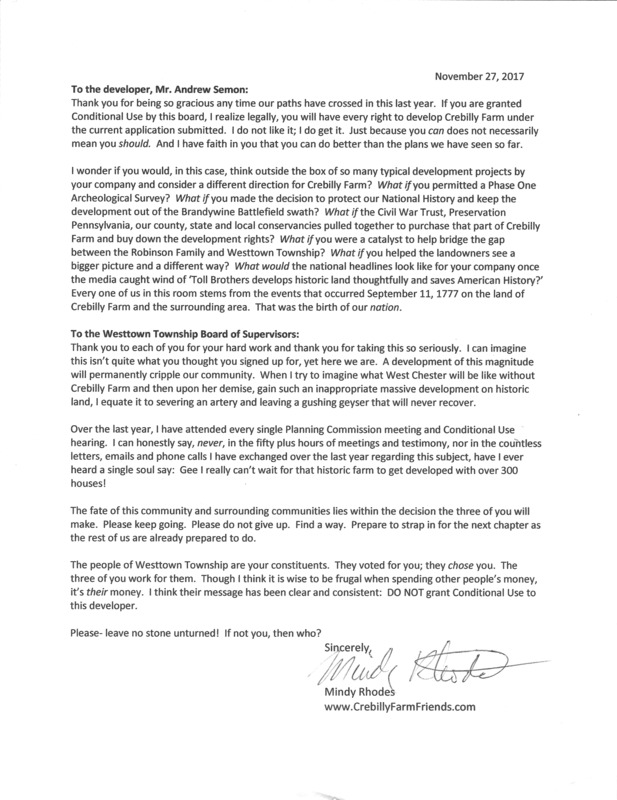 Mr. Chuck Pulcini’s letter to Chris Patriarca, Planning & Zoning Officer of Westtown Township. I trust you when I hear you and other members of the Planning Commission say you “feel our pain” on traffic issues and empathize with anyone who has to travel 202 or 926 etc during their daily commutes, either to work or to conduct errands etc using these roads. But please do not limit your empathy to just those who use these specific roads. Please realize that this planned addition of homes and the cars it will bring WILL ADVERSELY AFFECT all of the adjacent roads, specifically South Concord from Matlack to RT 926 as frustrated commuters look for alternate routes to 202 and try and avoid the 926 and 202 intersection. Brandywine at Thornbury HOA response to PennDOT Preliminary Review of Crebilly / Toll development plans. This is a very firm and respectful letter. The essence of your Preliminary Comments is to not only improve the internal traffic flow for the future residents of the Crebilly Farm project, but to use this “connector road” as a PennDOT-blessed workaround for the major traffic problems that exist at 926/202. In our view, you are transforming Bridlewood Blvd., which was designed and constructed to function as a local road serving a single community, i.e. B@T, into a major highway bypass. This is at the direct expense of B@T, putting in severe jeopardy the rights of B@T residents to safety for themselves and their children, and the quiet enjoyment of their property. Another consideration is the financial burden placed on Thornbury Township for additional traffic patrols and maintenance of a road that was never envisioned for this volume of traffic.